Senna is a wonder of a film. Composed of archival footage, the film inhabits a space that contradicts the recent faux-documentary movement that dwells on bending the truth (such as Exit Through the Gift Shop or Catfish). What Asif Kapadia succeeds in doing with Senna is compiling a linear work that serves to be made up of truths, with commentators offering a historical backdrop to the visuals. Given the time-span Senna covers, it’s a feat of editing technique, wherein hours of footage were shaped into a feature that make for a tremendously affecting experience. Walking into the film, I had limited knowledge of its subject matter, other than Aryton Senna was a Formula 1 driver in the late 80s/early 90s. You gather the pieces of life as the film progresses, though it’s never truly spelt in a clear and obvious way. Instead, we pick up on his characteristics as he broods over his upcoming races, as he interacts with his team, and as he flagrantly flirts with his interviewers. Again, none of these happenings are constructed after-the-fact – they act as archival material that is being shaped into a cohesive narrative. An integral aspect in what makes Senna so compelling is Senna himself – the Brazilian gushes with so much natural charisma that it’s hard not to get wrapped up in his exploits. His naivety and general recklessness makes for a character that is both directly relatable and interesting to watch. He’s someone whose ambition is stunted by those around him, and therefore you root for him to succeed – he’s simply a compelling figure. Like Steve James’ The Interrupters, a narrative is easily mined in Senna. 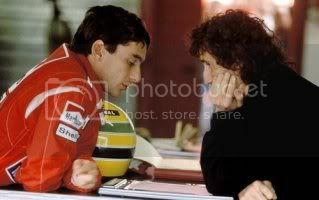 The central narrative device that pushes Senna along is the rivalry between Aryton Senna and Alain Prost. Prost represents an older generation of racers who plays Formula 1 politics to get ahead – a cautious driver, he served as the central figure of the sport during the 80s going into the 90s. Senna is the vibrant youth who is entering the field – the outsider, his recklessness is misconstrued as a death wish. The two men are on the same team, yet compete against one another with such fierce will and determination. Prost plays the political game to keep himself ahead; Senna combats that with his bravado and ability to connect with fans. The melodrama and intense rivalry between the two is so palpable – and it’s all constructed in a manner that allows the audience to perceive the events as they are. 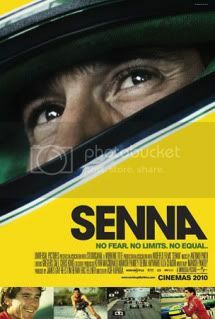 There’s no hiding that the film is constructed with Senna’s viewpoint in mind – his flaws are examined in so much as his strengths. But that’s really beyond the point, as Kapadia serves to construct the film as a moving tribute to a man who managed to bring people together. Senna’s allegiance and commitment to his Brazilian roots are incredibly moving, with Kapadia immersing the audience as spectators. But by the film’s end, your admiration for Aryton Senna is not done through persuasion, but understanding – you understand what he meant to people.